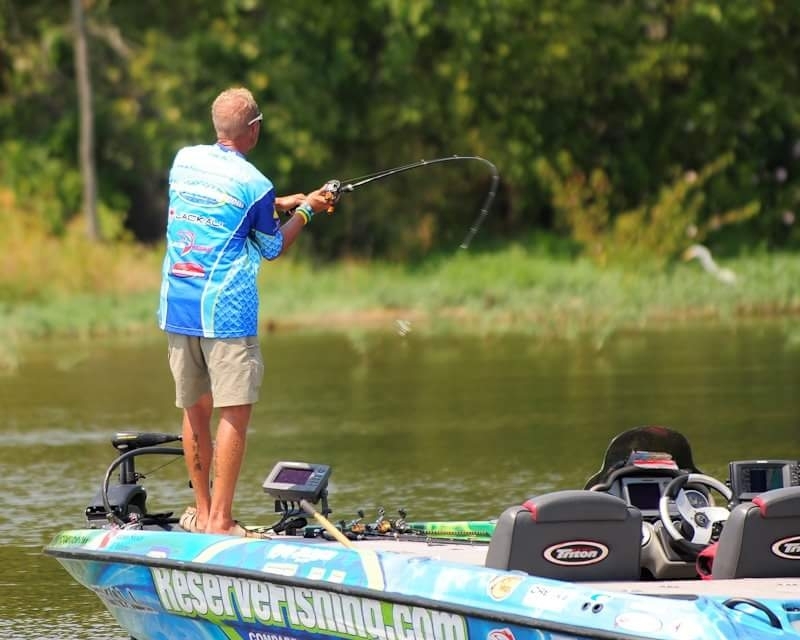 After stepping away from the main scene of tournament angling for a few years, The Rod Glove, Pro Bass and Fishing Guide Chris Jackson is back in the game, full throttle ahead to make it back to the big stage. Chris Jackson is an enthusiastic angler that loves the outdoors and time on the water. He is known for saying "Ready to go knock on some water time and do work! ROCK ON!!" Growing up as the son of a Police Officer, fishing was the important time for the family as it meant quality time spent with each other. Following in his Father's "footsteps", Chris began work with the Birmingham Police Department. After moving up within the department to the ranks as a Detective in the Narcotics Division, Chris decided one day to resign and become a professional angler. He never left his passion of law enforcement though but rather combined it with his passion for fishing as he conducts seminars with "Hooked on Fishing, Not on Drugs". He also pays tribute to his fellow officers with his tournament jersey and Rod Gloves, with the blue Rod Gloves representing his fellow Police Officers and the lime green representing his "ROCK ON" personality. Chris spends at least 327 days a year on the water as he is now the owner and lead guide for Fins-N-Grins Freshwater Adventures. He is also a USCG Licensed Captain and enjoys taking family and anglers out on the water to most Lakes in the State of Alabama including but not limited to the entire Tennessee and Coosa river Chains. He has the entire boat ready for a day on the water and protects his gear with The Rod Gloves. Having had some family issues, Chris has decided to buckle down and get his game face back on and "ROCK ON". He will be fishing the 2016 tournament season in the FLW Costa Open Events, as well as the ABA Ram Series. Chris plans on landing some big green ones to get him some big green ones this season. Keep an eye on this guy as he makes his come back. Chris is a member of several organizations including Professional Anglers Association, B.A.S.S., FLW, American Bass Anglers, and Alabama BASS Federation.